The At Sea residency programme aims to provide a quiet, and quietly inspiring, place for writers to concentrate solely on reading, thinking and writing without the distractions and pressures of the everyday. Writing is an endeavour that rewards persistence, time and concentration. At Sea hopes spectacular sunsets, a vibrant seaside culture and, above all, space will help. 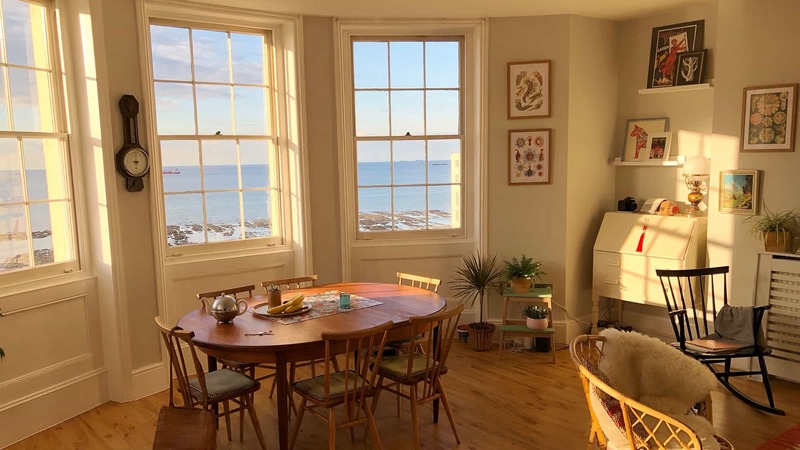 You will have full run of a two-bedroom, two-bathroom Grade-II-listed flat in Margate’s old Fort Lodge hotel, built in 1823. The flat is at the top of a majestic spiral staircase and is filled with hundreds of books for both reference and fun. There is a fully stocked kitchen and you will be provided, of course, with bedding and towels. NB: Unfortunately there is no lift in the building so, regrettably, the residency is not suitable for writers with mobility issues. As well as having private access to a peaceful seafront apartment, the successful applicant will be given a £250 stipend in cash. This should be enough to cover food for the week, as well as a little local sightseeing for inspiration. If you are travelling to Margate by train, we can also pay £50 towards your train fare. The next At Sea residency will run from Saturday 13 April to Sunday 21 April 2019 and is open to playwrights. The following residency will be in November 2019 and will be for poets. We would like to see a sample of your writing to help us make our decision: please submit a 10-page scene or extract of your writing – ideally from the play you plan to work on while in Margate – as well as a brief synopsis or outline. We especially welcome applications from playwrights from diverse or lower-income backgrounds. We would like to read a sample of your writing, and we also want to hear about you: please provide a few paragraphs about yourself, your background, your creative interests, and why At Sea would be helpful to you.